Welcome to the personal website of Kiel Gilleade. 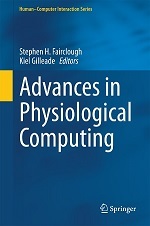 I am a computer scientist with a research background in Physiological Computing: computer systems that use brain and body signals as an input control. I’ve worked in R&D on a range of brain and body controlled systems including computer games, artworks and Quantified Self applications. Over the past few years I’ve worked in industry as a consultant on biofeedback technologies supporting mobile health companies. I also co-founded a mobile health startup to develop preventative healthcare products for diabetic foot ulcers. Currently I am working at the National Center for Supercomputing Applications.